PROPERTY developer Bolton Bhd will launch four projects worth RM1 billion this year as it is bullish on the market, its chief said. Executive chairman Datuk Azman Yahya expects its property sales to improve 50 per cent next year to some RM425 million. 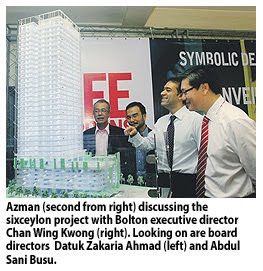 For the financial year ending March 31 2010, Bolton expects to achieve RM283 million in property sales. "During the slowdown two years ago, we were concerned about the ability of banks to lend, so we reduced our launches. But surprisingly, we came out of the global slowdown unscathed and the pick-up (in economy and property) has been good. "Our sales improved in the last two quarters and we are seeing a pent-up demand," Azman said. He said that with a low gearing and some RM60 million cash in hand coupled with new sales, Bolton was on a good financial footing to launch new projects. It has 240ha of landbank in the Klang Valley and Penang, with expected sales of more than RM2 billion to drive the company's growth. In the financial year ended March 31 2009, the developer posted net profit of RM18.3 million on revenue of RM292 million. Property sales contributed the bulk of earnings, with the rest coming from its investments in properties. On the redevelopment of the 12-storey "Bolton Court" in Bukit Ceylon, Kuala Lumpur, Azman said the company will start building a 33-storey condominium block on the site six months from now, to be named "sixceylon". "Although Bolton Court contributes positively to our investment earnings, we feel it's time to redevelop it to create a new landmark in Bukit Ceylon," he said. The company built Bolton Court, comprising 20 condominium units, in the mid-1970s and retained the apartments for recurring income. Sixceylon will feature 215 condominium units with built-ups ranging from 696 sq ft to 1,555 sq ft.
At the unveiling yesterday, Azman said the units will be priced from RM750 per sq ft to RM900 per sq ft each, or from RM600,000 to RM1.2 million. In comparison, prices of new residential units in Bukit Ceylon range between RM900 per sq ft and RM1,100 per sq ft.
"Based on feedback, I am confident we will have a market for sixceylon. We are targeting foreigners and young Malaysians," Azman said, adding that investors can expect 7-8 per cent returns. Sixceylon will be launched to the public in June, following which Bolton will introduce "Wharf", a mixed waterfront development in Puchong, Selangor, and "Arata" at Kenny Hills and "51 Gurney" at Persiaran Gurney in Kuala Lumpur. SUBANG JAYA: TH Properties Sdn Bhd and Naza Properties Sdn Bhd have formed a strategic alliance to develop a high-end residential project with a gross development value of RM100mil. Zaharuddin Saidon (left) exchanging documents with Datuk S.M. Faisal S.M. Nasimuddin. With them is TH Properties chairman Datuk Azizan Abdul Rahman. TH Properties chief executive officer Zaharuddin Saidon said the project would involve 52 single and double-storey luxury bungalows with Italian concept in Bandar Enstek, which borders Negri Sembilan and Selangor. “We plan to launch this project in June,” he told a press conference after the signing of a memorandum of understanding (MoU) between TH Properties and Naza Group yesterday. TH Properties, the development manager of Bandar Enstek, is a wholly-owned subsidiary of Lembaga Tabung Haji while Naza Properties is a unit of Naza Group. Naza Group joint group executive chairman Datuk S.M. Faisal S.M. Nasimuddin said the company was exploring the possibility to bundle the luxury property products with cars under the Naza Group. “The type of cars will depend on the demographic of the buyers and we are in the midst in finalising the details,” he said. Faisal pointed out that the synergy between two companies promises endless possibilities and there were many aspects that they could share. “The MoU also marks the collaboration between TH Properties and Naza Group in identifying and participating in various fields in the future,” he said. Faisal said future collaboration could be in any field that Naza Group was currently involved such as auto, finance, property management, insurance, plantations, agriculture and transportation. “This (signing of MoU) is just a starting point and we are in the midst of identifying more projects to work together,” he added. NAZA Group of Companies and TH Properties Sdn Bhd have agreed to work together in identifying and participating in various initiatives that the two can collaborate in. 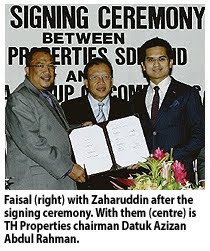 Naza signed a memorandum of understanding with TH Properties on this matter yesterday. The first venture involves the development of 52 high-end residential enclave bungalows with a gross development value of RM100 million at Bandar Enstek, Selangor. Naza Properties Sdn Bhd, a company under the Naza group, and TH Properties are expected to jointly develop the luxury bungalows. It is understood that the project, which is specifically targeted at the Malaysia My Second Home (MM2H) market, will see the properties bundled with vehicles from Naza. "We are still working on the mechanism of partnership, but the idea is to provide lifestyle solutions for buyers of the properties," Naza Group joint group executive chairman Datuk SM Faisal Tan Sri SM Nasimuddin told reporters in Petaling Jaya yesterday. He declined to reveal which of Naza's dealerships would be involved in the deal. Naza holds the distributorship for Maserati, Ferrari, Chevrolet, Kia and Peugeot cars in Malaysia. The Italian-inspired designs for the luxury bungalows bodes well with Naza, as it has several luxury brands under its stable. "I believe this is an avenue that we can cooperate in to provide the ultimate luxury experience within the project's framework," Faisal said. The home with a car/bike promotion is especially targeted at the MM2H market due to the unique nature of the programme that allows foreigners to purchase a new car made or assembled in Malaysia, and be exempted from paying excise duty and sales tax on the new car. "The synergy between our two companies promises endless possibilities. There are many aspects that we could share with each other, especially with each of these companies having varying experiences and capabilities," Faisal said. On the development of Bandar Enstek, TH Properties chief executive officer Zaharuddin Saidon said, 30 per cent of the 586.38ha it covers have been developed and sold. KUALA LUMPUR: GAMUDA BHD is buying a 60% stake in Vietnam's Tan Thang Company for US$82.8 million which has rights to undertake a property project in Ho Chi Minh City with an estimated gross development value (GDV) of RM6 billion. It said on Wednesday, March 10 its unit, Gamuda Land (HCMC) Sdn Bhd was buying the stake from Sai Gon Thuong Tin Real Estate Joint Stock Company (Sacomreal). Gamuda said Tan Thang Co. has the rights to undertake a project on a 825,216.5 sq metre site in Son Ky Ward, Tan Phu District, Ho Chi Minh City. "Tan Thang Company will undertake the Project comprising medium-end and premium residential apartments, a sports complex and an educational complex on the land. The project is expected to generate a GDV of RM6 billion," it said. Gamuda said the first sales launch is expected to commence in the second half of this year and over a seven-year period. Under the agreement, would loan US$66.24 million to Tan Thang Co. at 13% per annum. The loan shall be repaid to Sacomreal once Tan Thang Co. has secured and drawndown from the project’s lender. Gamuda HCMC will fund its share of equity participation in Tan Thang Co. via shareholder’s advance from Gamuda using internally generated funds and/or bank borrowings. "The project will enable Gamuda to strengthen its position in the property development industry in Vietnam," it said. DIVERSIFIED palm oil group Kulim (M) Bhd is selling its property Menara Ansar in Johor, to AmanahRaya Trustees Bhd for RM105 million. Kulim will be paid partly in cash of RM63 million, while the remainder will be through the issuance of 42.9 million new units of Al-'Aqar KPJ Real Estate Investment Trust (REIT) at an issue price of 98 sen per unit. AmanahRaya is the trustee of Al-'Aqar REIT. Kulim managing director Ahamad Mohamad said proceeds from the divestment will be utilised for repayment of the group's borrowings.